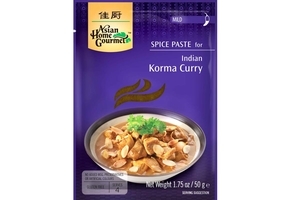 Asian Home Gourmet Indian Korma Curry Seasoning in 1.75oz (50g)sachet. Using Only High Quality Fresh Herbs & Spices and No Added MSG, Preservatives or Artificial Flavor. Korma Curry Originates From Northern India Has a Moghul Influence. This Mild Curry With a Thin Sauce Can Be Enriched With Cream, Yoghurt and Almonds To Give a Delicious and Rich Taste. Vegetarian Society Certified. Halal Certified حلال . Soyabean Oil,Coriander,Garlic,Ginger,Salt,Onion,Tomato Paste,Chilli,Turmeric,Black Pepper,Star-Anise,Cumin,Natural Herbs And Spices,Tarmarind.